India as a travel destination has many merits: from the exciting history and its trailing architectural wonders to the colorful and rich culture and the delicious food. But one of the most important virtues of travelling in India is that it offers experiences at prices for any type of traveller, backpackers and luxurious vacationists alike. By reading this, it’ll help figuring out the cost of travelling in India and help plan the budget to get the most out of it. India is an inexpensive because of its low rates in accommodation, transportation, service and food and also its weak monetary value. But one doesn’t necessarily have to stay at hostels, simple BnB’s, and eat cheap street food non-stop. There are a huge variety of options in every category. 5-star hotels and mid-range boutique hotels and resorts, luxurious train travel, private cars, gourmet and international restaurants – everything is available! This range is for young adventurous backpackers ready to experience India to the fullest and out of your comfort distance. This would include stay in dormitories at backpackers’ hostels or private rooms at cheap budget hotels. You’d travel on local buses and trains and take only one domestic flight for the longest distance. You’d also eat both street food and in restaurants and visit the most popular sights. If you’re the kind of traveller who likes to keep it on the economic side, but without taking the comfort out of your vacation, this category is for you. If you can increase your budget by adding 40 USD or 30 EUR to that of a backpacking trip, you will be able to add significant value to your trip. You can stay at charming boutique hotels and friendly homestays, travel faster by including a few internal flights. You can also choose from the best train classes available and few chauffeur-driven car rides. From time to time you can treat yourself with a meal at a fancier restaurant and add one activity per city like cooking classes, a desert safari or a nice trek. If you’re used to luxury travel, you’ll be delighted with the variety of options India has in store for you, especially in terms of hotels and resorts. You can fly your way to most places and travel in a comfortable, air-conditioned SUV. All the big cities and some of the smaller cities as well offer great gourmet dining options that shouldn’t be missed. In big cities, tourist havens and during the winter months of December, January, and February, the hotel tariffs are higher. They’re lowest in the off-season in the monsoon season and from May to August. As a budget traveller you can easily find hotels/hostels in India between INR 700-1500 (9-20 USD, 8-18 EUR) a night that offer a clean simple room or a nice dorm bed. Breakfast is sometimes included but not always. An exciting new prospect for backpackers looking at visiting India is the quirky new hostels that are springing up across India. They are safe, clean, fun (they plan great activities) and a wonderful place to meet travellers. We tend to include them a lot while planning trips for backpackers. One can also find cheaper places to stay in India. As low as INR 300-500 (4-7 USD, 3-6 EUR) a night, but cleanliness and safety is questionable. These are best if booked after being personally inspected. Our calculation is based on budget hotels between INR 800-1500 (11-18 USD, 9-18 EUR) a night. A little more comfort! If you are looking at a private room and private bathroom at all times. Ranging between simple and spotless rooms on average, to a few heritage or boutique stays you would spend an average of INR 2500 (34 USD, 29 EUR) for a room a night. You would have breakfast included for most nights, a private bathroom every night, and some hotels may have a pool, a garden or a very nice view. To give you an idea on hotels that you would be staying at: Mewar Haveli, or Kankarwa Haveli in Udaipur or a lovely homestay in Jaipur. You like a comfortable bed, affordable boutique or heritage hotels, rooms with a nice view (when possible) and a nice pool every now and then. Then you would spend an average of INR 4500 for a room a night. Comfortable beds with nice views, affordable boutique and heritage hotels, and a nice pool the majority for the time; INR 4500 (61 USD, 53 EUR) is the average a night. A rich and nice breakfast would always be included. You’d be staying in many heritage hotels or boutique stays. 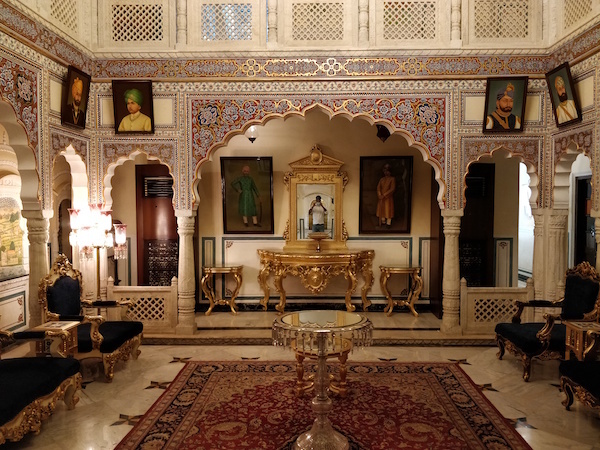 For instance, Shahpura house in Jaipur or Ratan Vilas in Jodhpur are such heritage hotels focused on comfort. You would predominantly be using trains to get between places. We have accounted for fares using A/C class train travel. 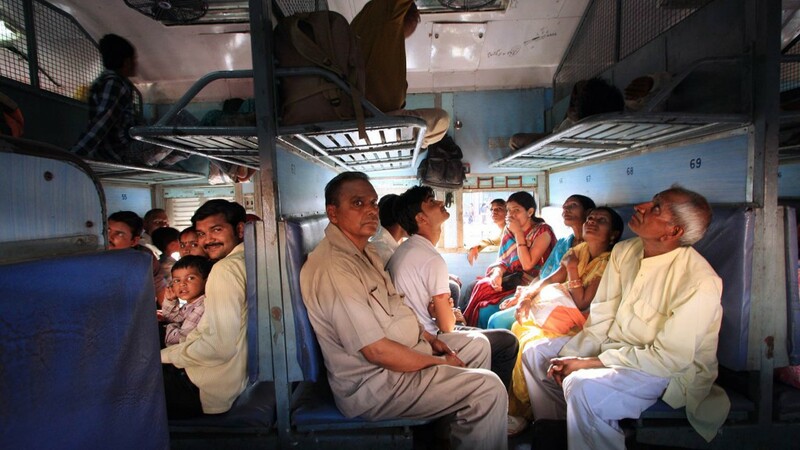 Remember trains are a great and inexpensive way to travel around India, but on some routes trains are not possible or train tickets get sold out by the time you decide to book, so you would have to take buses then. Sometimes local buses are only available at the destination and cannot be booked by us. You will use public transport, foot or tuk-tuks (auto rickshaws) to travel within cities. 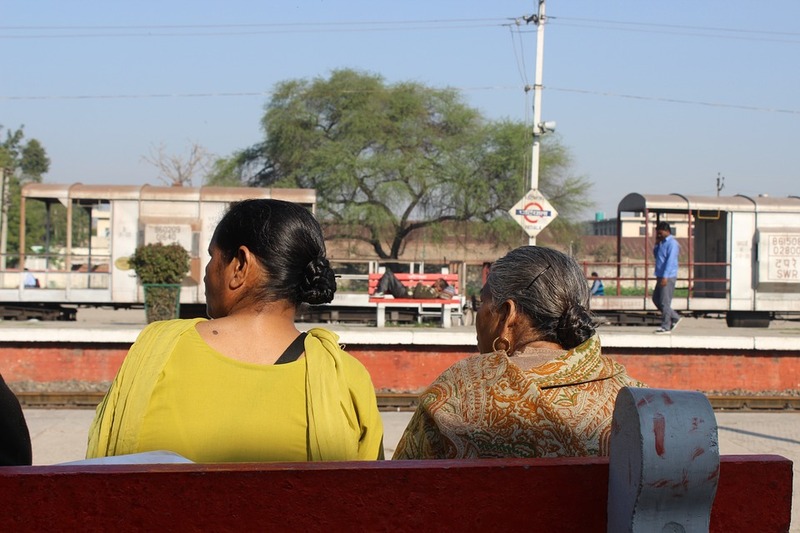 You should account for an average of INR 800 (11 USD, 9 EUR) per person per day as transport expense. North India by train and bus or a backpacking Tour of South India is inexpensive and fun. You would have a car and driver for most of the route. In addition, train rides would always be the best available A/C class and only an option if it were the most convenient solution. You would take flights whenever distances are too long. Having a car and driver through your trip in India is a comfortable and flexible way to explore the country. You would be spending an average of INR 1500 (USD 20/ EUR 16) for transportation per day. 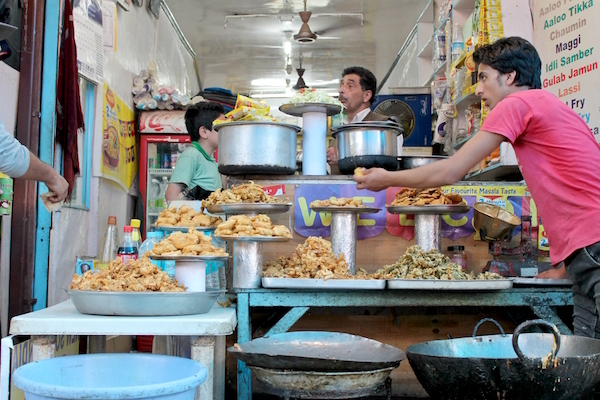 India is not an expensive destination when it comes to food. However, in bigger cities and touristic places food can be expensive at times. In general, if you eat at local restaurants you would get breakfast (omlette/parathas/idli/dosa) and a cup of tea or coffee for around INR 60-80 (1 USD/ EUR) per person. Lunch and dinner would cost you a minimum of INR 80-150 (1-2 USD/ EUR) per person/per meal. And you can expect a warm and fulfilling meal at that price. Hygiene could often be circumspect, but that is a risk you are always going to have to take when travelling in India. Often food from good restaurants can get you sick too. To reduce the risk, always avoid deserted restaurants; eat at places that have a lot of people. Finding local restaurants in bigger and mid-sized cities (Delhi, Mumbai, Jaipur) is quite easy. In smaller towns and especially it is harder as every restaurant is set up for tourists (=expensive). Be prepared to explore and go beyond the touristy parts of small towns. Meals at nice restaurants can set you back by approx. INR 250 – 400 (3-6 USD/ EUR) per meal, per person. This price would not include alcohol. If you plan to go to fine dining restaurants, eat at five star hotels with a great view then a meal can cost anywhere between INR 1000 – 2500 (12-35 USD/EUR) per meal, per person. 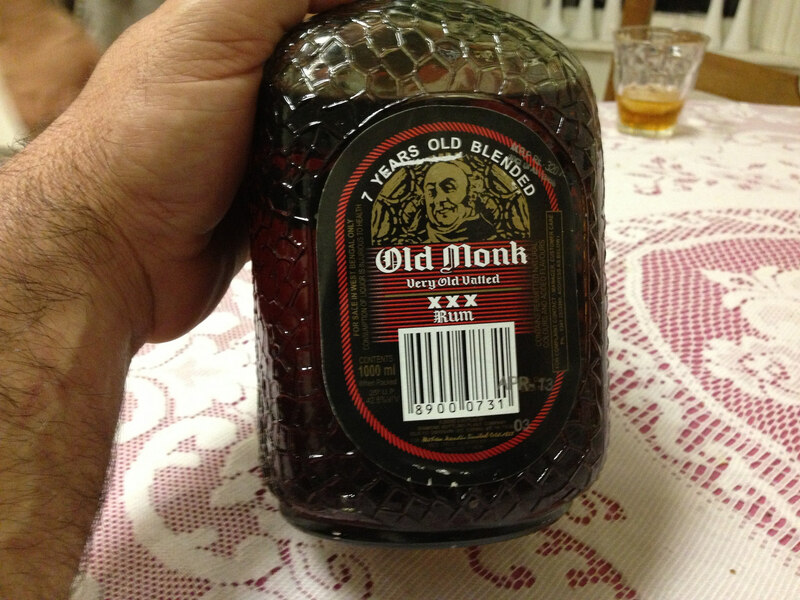 There are a couple of aspects one needs to keep in mind when it comes to alcohol in India. i.e. availability and the price. It’s not very difficult to find in India. However, you can’t take it as a given that all hotels and restaurants will serve alcohol. A lot of restaurants may not have alcohol on their menu (as they do not have a license to serve) but will arrange it if asked to. Hotels that do not serve alcohol usually let you carry your own alcohol to the hotel. Alcohol cannot be purchased at supermarkets, but India has what we call ‘wine shops’ that are dedicated just to selling alcohol. ‘Wine Shops’ are not easy to find, so ask your hotel / driver about the nearest one. Alcohol is more expensive in bigger cities like Mumbai and Delhi where taxes are higher. A beer at a bar/pub/club could start from INR 150 to 500/600 (2-6 USD/EUR) depending on the place you’re going to. Stronger drinks (whiskey, gin, vodka etc.) could cost from INR 200 to 1000 (2-13 USD/EUR). It’s hard to generalise because it very much depends on the place you’re in and what you’re ordering in particular. It could range from extremely cheap to very expensive even for foreign standards. Alcohol is about 30-35% cheaper in smaller towns. At ‘wine shops’ expect the price to relatively cheaper in everything. India charges a differential entrance fees to Indians and to foreigners, (15x more to a foreigner). This might seem a little unfair but it is mostly to create the possibility for every citizen of India to visit every kind of monument despite financial restraints. However, children under the age of 15 still enter free into most monuments. If you have a valid student ID you’d get a highly discounted entrance fee. You should budget INR 3000 (40 USD/ 35 EUR) per person for monument entrance fees when visiting India. However, in some places like Delhi, Jaipur or Agra you will spend more for sightseeing than in other places like Goa or Kerala, just because there are more. In the places with fewer monuments you will most likely spend more on activities. In addition to the above discussed expenses we expect you’d spend money on shopping, miscellaneous things, and the occasional tip. Keep in mind however, that these are all approximate prices and can be slightly different to the real-time prices. Since the rupee changes quickly and sometimes even drastically, expect some slight changes. Regardless of the changes, we give a comprehensive list at every location with no transparent costs, so you won’t be surprised when something comes at you. You would probably participate in a range of activities when visiting India. The cost of the same can vary from activity to activity. At times it would sound unreasonably cheap and sometimes compared to prices of everything else in India feel a little expensive. Cooking classes cost between INR 750 to 1500 per head (10-20 USD, 9-18 EUR). This is usually a 3 to 4 hour class and you eat an entire meal that you’ve just prepared. So great value for money. Riding an elephant in Amer Fort, Jaipur costs INR 1000 (10-15 USD/EUR) for two people/riding one elephant. But be aware that the elephants don’t always enjoy fair treatment! Account for INR 6000/10,000 (110/150 USD/EUR) per head for two weeks for such activities. While using a travel agency may seem like an unnecessary cost, we’ll actually save you a huge chunk of your budget by streamlining your trip. We can get better deals on hotels and travel and make sure you don’t get duped. By advance booking of flights and trains you save good amounts of money, so you can spend it on something for yourself. Tell us about your travel preferences and your budget, and let us do the rest of the tedious stuff for you.